The next revolution of public transport in Auckland now has a date, August 14. That’s the day that the city will finally shed its clumsy and expensive fare system with Auckland Transport finally implementing what they call Simplified Fares, also known as integrated fares, which will be smarter and in many cases cheaper. Currently Auckland has a stage based system where you pay for every bus, train you use based on how many stages you pass, with only a small transfer discount for those that use multiple services. With Simplified Fares it will shift to paying one fare for your total trip based on how many zones you travel within and that includes using up to five services to get to your destination over a four-hour period. Even better is the cost for most trips is set to get significantly cheaper for a lot of people thanks to the new fare structure. The confirmed fare map is below and AT say this about it. Zone overlap areas (grey coloured areas on the new fare zones map) at some zone boundaries allow for travelling to the edge of the zone borders without crossing into another zone. With an AT HOP card, you will pay for one entire journey from A to B, instead of paying the fare on each bus or train separately. You can use up to 5 buses or trains within 4 hours, just ensure you transfer between each trip within a maximum of 30 minutes. Tag on and off each bus and train as you do now and simply count the number of zones you travel through to find out your fare. As mentioned for many fares will get cheaper or at least not get more expensive, in fact AT advised me that they calculated 99% of all trips taken will fall into that category which is great news. As an example of just how much cheaper this makes trips, here are a few personal examples. They don’t entirely reflect the costs I pay as I usually use a monthly pass simply due to how expensive it can be but that also makes it a good example. 1-stage bus to Victoria Park = $1.30 ($1.80-50c transfer discount) – I could reduce this to $0 if I used the City Link or walked up to Wellesley St but both are less convenient. Instead with Simplified Fares I would pay for 4-zones, Waitakere, Isthmus, City and Lower North Shore and all up that would be $6.00. That’s a saving of $3.90. Even if I was just going to the city, for 3-zones I would be paying $4.90, a saving of $1.10 over the current HOP price. If you don’t use HOP – why wouldn’t you and now over 80% of trips are by HOP – cash fares are changing too. The fares have been rounded to a dollar amount which should help make it easier for drivers needing to give change. See AT’s website for those details. In addition to the zonal fares, AT have introduced a new child weekend fare which looks good with a maximum trip cost of 99c for using HOP with a child concession. 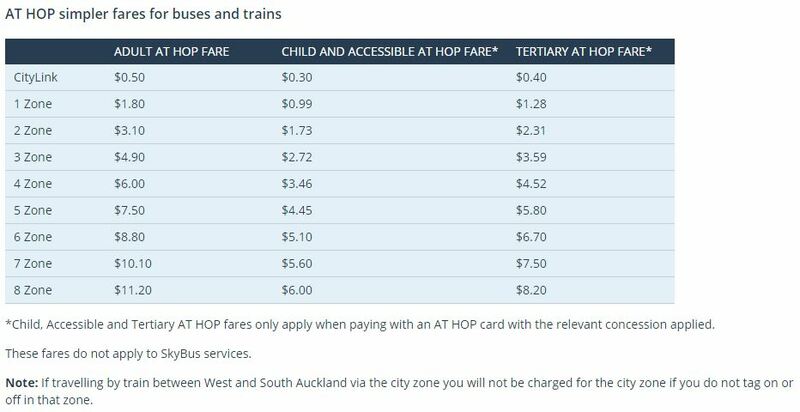 A new AT HOP child weekend fare will be the most you pay for weekend and public holiday bus and train journeys when paying with an AT HOP card with a child concession applied (excluding SkyBus services). You can take up to 5 bus or train trips over a 4 hour period with a maximum transfer time of 30 minutes between each trip and pay a maximum 1 zone fare (99 cents from 14 August 2016) regardless of how many zones you cross. Like the monthly pass, AT are also moving to a single Daily Pass which will cover all zones. It also comes with a price change and will be $18 as opposed to the two passes it replaces being $16 and $22. I can’t imagine too many would buy this. AT have said in the past, and reconfirmed to me recently that they want to eventually move to having daily and weekly fare caps which would solve this issue. At this stage the new fares only cover buses and trains. I’m aware that AT plan to integrate ferries into the mix although that doesn’t necessarily mean there will be fare parity. We’ll have to wait to hear more about this from AT. Overall this is going to be great for Auckland and I can’t wait for it to be implemented. Looks great to me; good stuff AT. I could also see that ‘cheap weekend fares for kids’ thing being an early test – if successful perhaps they’ll roll out cheaper off-peak fares to us non-kids as well? They will remove the kids monthy pass, which means kids going to school via pt will be more expensive in the future. Doesnt make sense to me. What does this exactly mean:”If you are paying with an AT HOP card and travelling within a zone overlap area as part of a journey (this means tagging on and off within the same zone overlap area), this may count as travelling through a new zone”? The use of the word ‘may’ isn’t very reassuring either. So if I am taking a journey solely within the Manukau overlap area (say Manukau Station to Puhinui), I may get charged a new zone, so a total fare of two zones? This raise a big concern for residence who lives in Otahuhu, trying to take the local connector bus, and transfer via the new Otahuhu train station. Whenever we transfer via the train interchange, it will incur additional zone fare. It simply discourages residence to transfer via train. For example, if we take direct bus from Otahuhu town centre to sylvia park and transfer to britomart it will be 2 zone $3.1. However if we take bus from Otahuhu town centre and transfer via otahuhu train station to britomart, it will be 3 zones $4.9. I believe this rule is discouraging Otahuhu people to use the new Otahuhu train interchange station. Similar issue applies to manukau snd westgate. I don’t read it that way. I think it just counts as 2 zones either way as they know this transfer there will be common and the overlap zone is to support the hub type transfer network without penalty as I see it. If you did a journey ending up near the edge say in the Manukau one perhaps that’s when it would count as another zone. I’m VERY confused by this too. I’d like AT to provide some clarification. The “Constellation” overlap is huge – what does that small print actually mean to these people? Kelvin, I worked on the consultation, and this is my understanding of it. Fear not, you don’t pay any extra. You only pay for the amount of zones you’ve been in on your trip, so your connector bus would be effectively free. You don’t pay to enter or travel around a zone and then also pay to leave it – you only pay once (if you transfer within a certain amount of time. if you get off the bus and get another bus or train hours later then you would pay for that zone again because it’s a new trip). You could get 3 buses and stay within 1 zone and you would only get charged for that 1 zone once. The overlap is for this purpose: If you took a bus from Constellation into the City, Constellation becomes Lower North Shore. If you took a bus from Constellation to Albany, Constellation becomes Upper North Shore. If you start a trip in the overlap, the overlap becomes the zone you head into, so you don’t pay an extra zone. When I say the amount of zones you’ve been in – this is calculated by your tag on / tag offs. If you get on a bus in Isthmus, it travels through the City Zone, goes back into Isthmus and you get off in Isthmus, you get charged for 1 zone, not 2. Total = 3 Zones HOP = $4.90. Same trip using cash would be 4 zones (2 x 2 Zone tickets) as you can’t transfer without hop. If I read this correctly, it seems to mean that for me, going from Pukekohe to Britomart is five zones – thus $7.50 one way (I am over 65 so don’t have to pay after 9AM), instead of the current $8.40. Is that right?? And at the moment, I then take a bus up from Britomart to the University, where I work, which is another $1.30. I don’t understand this transfer business. If I get off the train in Britomart and get onto a bus five minutes later at the bottom of Anzac Avenue, how do I make that a transfer instead of a new trip? Or does the system just know that since I tagged off five minutes ago, it’s a transfer? Yes so your trip would be $7.50 and your bus up Symonds St would not cost anything, all part of the same fare. OK – so you reckon the system will just know that I am in the same zone and tagged off in the time limit? It will be interesting to see if that is true 🙂 It means that instead of $9.70 – $8.40 + $1.30 – I will pay $7.50, saving $2.20/day, $11/week. I like it! Yeah that’s correct, the system already knows exactly where you tag on and off and at what time, and charges accordingly. Think of it this way, you won’t pay for a using any particular bus or train anymore, you just pay for however many zones you travel through in your journey regardless of how many buses or trains you take (up to a limit of five in one journey, as long as there is no more than 30 mins between each). This also means you can make a short trip to run an errand or something, and if you take less than 30 minutes to get back on the bus home you don’t get charged the return fare. That’s pretty useful. To be honest I wonder why they bother with the five trip limit. The number of people making more than five trips in a couple of hours must be tiny. If they dropped the limit they could advertise it as “unlimited travel for up to four hours for the same price”. Do integrated fares apply to the Inner Link bus, given it is/was a “fully commercial” service? It’ll be fun to try the Link Bus pub crawl challenge. Can you visit a bar in Downtown, Ponsonby, K rd, Newmarket, and Parnell all on one fare. My understanding is it applies to absolutely everything except the Airbus and the ferries, and they are planning to integrate the ferries over time. Actually not sure on school buses, assume they stay with their own pricing but dunno. …oh and a pub crawl where you have no more than 30 minutes to get in, drink and get back on the bus again at each stop sounds like a recipe for trouble! Hmm not a chance. With buses every 15 minutes, you’d have to catch the next bus to reliably ‘transfer’ within 30 minutes. The bus afterwards might arrive after 25 minutes or after 35 minutes — too late. Anyway I’d do my crawl in the city centre, on foot. Another cheers to density . Will weekends be defined using the same way the police define long weekends, from 4pm of the day before the first full day off to 6am the last full day off? They’ve also postedcontradictory advice with how to transfer, saying both that you can skip the city zone if you don’t tag off for your west-east train transfer, vs that you need to tag on and off each bus and train. Even the staff occasionally get confused at this one about whether you need to go out and back in through the Britomart fare gates when transferring west-east (you don’t but there’s cases of staff blocking people transferring on the mistaken belief that you do need to). The tagging off each train is surely unnecessary if you are going to be getting on another train within the 30 minutes. Buses I can understand but trains is a bit unnecessary (most places don’t require this unless you are actually leaving the station eg in London Hammersmith has 2 stations across the road from each other so you have to tap out and back in again – the system doesn’t charge you extra for that though by the way). I certainly don’t tag off at Papakura when I arrive from Pukekohe on the diesel and then tag on again before getting onto the electric. I certainly hope this isn’t going to change! You don’t need to tag on/off at Newmarket when transferring trains, my card history shows tag on at Ranui and tag off at Ellerslie. I’ve had a ticket inspector on the train check my ticket at Greenlane after I’d transferred without tagging on/off at Newmarket, coming from Henderson. All he did was remark that it was a long trip. I’d never thought to transfer any other way on the train…. Suspect thats more an informal form of ticket inspecting/fare evasion detection – if you can’t exit the gates – you obviously didn’t tag on in the first place. A bit clunky way to do it though, even if it may be somewhat effective in targeting fare evasion. In theory it shouldn’t cost more to do that under the current system [and you might pick up the 50 cent transfer discount] but would under the new one. We’re not set up like New York is, where to transfer to a new line or change direction you often have to leave the station. So once inside the barricaded area you are free to move to any train you like, the system can work out how you got there from A to B. Getting out the gates is not that difficult as your hop card doesn’t need a positive balance and can even have been cancelled and you can still get out, you can’t get in with these but with only 4 stations on the whole network gated that doesn’t create too much of a problem. Yes I know you shouldn’t tag off / on again when transferring trains – my point is the AT advice there is misleading. That only applies to buses. With trains, you tag on when you enter the network at your origin station, and tag off when you exit the work at the destination station. This may confuse people. Wow, my teenage kids are going to love weekend travel for 99c. Does this only apply to 15 and under, or students as well on a concession? Yes this will be great, we often have our kids sent off on PT by themselves….only thing is if there is an hourly frequency the transfer time may be too great to count! I’m thrilled they’ve introduced this too, and I don’t even have kids. Assuming my maths is correct – if you’re an adult travelling with two kids to (say) Auckland Domain and back over 3 stages, the total cost of their return trips just went down from almost $10 to $4 – if you do the return trip within 4 hours it comes down to just $2. Add in an adult fare there and back on a HOP card, and what was a $17 overall return trip becomes a $10-12 one. That’s the kind of fare drop that will make weekend bus and train travel with kids a serious proposition for a lot more people – for the retired or people on a fixed income, or without much cash or access to a car. And obviously it gives potential for young people to be independently mobile at far lower cost, which (although requiring some sensible management of risks by parents/guardians etc) is an Officially Good Thing that ought to be strongly encouraged. This has huge potential benefit for a lot of people, with minimal if any downsides at all, not to mention promotion of public transport use itself. Honestly, I’m stoked. Quite right Sam. Wish they’d had this when I was a teenager. I wonder if it counts after midnight Friday night? or just from Saturday morning. Is this right? You are still crossing zones even if you wind up in the same zone? Only if you stay for less than 30 minutes tho! I’m told that does occasionally happen with younger kids, in which case an extra $2 in the pocket could go towards the Retain My Sanity Late Evening Red Wine Fund. We don’t have kids of this age either but it is a great lesson for kids that there is another way to get around than relying on someone to drive them. Hopefully they will walk more and this may help our child obesity problem. Its time we got serious about public transport in Auckland & stopped tinkering around the edges. We need to face the fact that mass car dependency is incompatible with creating a modern ‘liveable’ city. We need to engage a completely new mind-set with public transport the primary means of mobility. Divert funds earmarked for extravagant motorways into a decent integrated public transport network – make is SO attractive to use, that most people would only use a car for special occasions. Start by making all public transport totally user-friendly: Dump these expensive ticketing systems and make all urban public transport free at the point of use – comfortable, frequent, 24 hour services, no-emission vehicles, free wifi, ‘ambassadors’ on board to assist passengers and leave the driver to focus on driving, passenger shelters that actually protect people from the weather, more bus lanes & priority signals etc.. combined with more walkways, cycling facilities and car-free streets. For ferry users, who must transfer at each station, this is worse than useless. We’ve waited years for integrated fares, only for AT to design a system specifically to exclude ferry users.. What about an explanation from them, an apology and some compensation? What would the justification for a ferry premium be? Even if there is a difference in operating costs I dont see why it matters. I suspect buses and trains have different operating costs yet under the new fare system they are treated equally. I agree – there’s no justification for any premium. The Devonport peninsula has the poorest public transport outcomes in urban Auckland, so AT needs to make extra effort to support public transport there, not undermine it. The good news is that we have a new zone system that is a great improvement on the old one, and a new fare structure that is also much improved. But it needs to be inclusive rather than exclusive. With zone and fare structures already agreed, and HOP card readers installed at ferry terminals, everything is in place to include ferry users on August the 14th. Ferries generally offer a significant line of sight advantage over say bus transport between the same two locations but also cost more to run. Devonport being the obvious example, it’s quite realistic to expect to pay more for the ferry service to the CBD as it’s a far better service than the bus. In saying that it would make a lot of sense to just integrate it into the fare structure just for simplicity. But why should we pay more for services that are faster and more direct? That doesn’t apply for other modes – it costs exactly the same to take a fast direct train journey across two zones as it does to take a slow meandering bus. No reason for a Devonport Ferry to cost more to run (something like the Waiheke Ferry is different but the Devonport Ferry operates within the relatively sheltered inner harbour). The problem with the Devonport Ferry is that it isn’t particularly fast or efficient and isn’t very frequent either. 2x smaller and faster ferries would do a much better job than the Kea. Doesn’t need to be unnecessarily complex double-ender either. The key is to have easy multiple boarding platforms so that people can get off and on very quickly for quicker turnaround and have 2x ferries so that people aren’t waiting around. Coupled with cheaper fares then patronage would be a lot higher. Nick – it is perfectly normal to charge more for something that is faster and more direct. The heathrow express costs a lot more than the Heathrow Connection or the tube, simply because it’s a premium service. Also the rail network operates as a key spine of the new bus network, it’s hard to argue this of ferries at the moment with their infrequent and erratic services. This doesn’t of course mean that we automatically should, but you were looking for a justification. It would be ideal to have everything at the same price, but tying up or limited PT funds subsidising ferries that are already well patronised may not be the best use of this money, or as Bruce suggests it could be if it resulted in a significant increase in patronage. So Fullers is allowed to run commercial routes. The question then becomes, how much does AT charge Fullers for use of their facilities on these commercial routes? Ferry terminals etc don’t come cheap and they occupy fairly premium real estate. One assumes they should be charging them a usage fee based on a commercial rate of return on these premises. That might change their position on gross contracting. Right that’s interesting. So let’s hope they charge Fullers commercial rates for usage. I can imagine that would amount to a few million a year for the Devonport route. Ferry passengers pay 50c wharf tax per trip on the Waiheke ferry. My recollection is that there is also a per passenger levy for using the Downtown wharf as well. Funny thing is in the case of the Waiheke wharf tax the total collected annually has dropped markedly whilst the passenger numbers have increased! AT won’t release any detailed information stating that it is ‘commercially sensitive’. I don’t have an issue with paying a ferry premium. 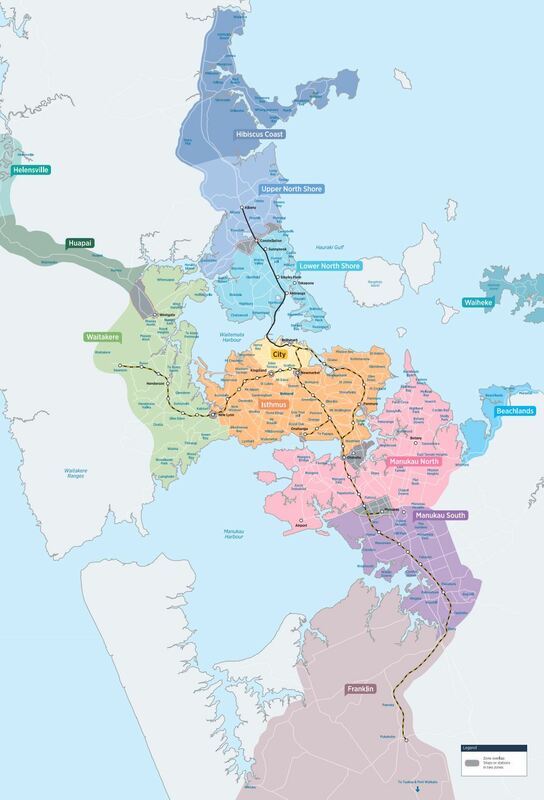 You almost need a premium – Hobsonville to CBD would be 3 zones via Isthmus or 4 zones via North Shore. A straight line ferry would be 2 zones (Waitakere to City). You can blame Gerry Brownlee for that David B. Fullers got a sweetheart deal from the big fella (who knows why)! But that deal, and the subsequent amendment to the LTMA, made specific provision for lower fares to be implemented – the caveat being that Fullers themselves have to operate without a subsidy. Fullers confirmed back in 2013 that they are committed to integrated ticketing, so what has AT been doing these last three years? Looking to Cr Darby and co. to fix this, and urgently! There’s nothing to stop an arrangement being made as per Section 130 (3) of the Act. In many ways it’s a similar situation to dealing with bus companies, and with HOP cards it should be trivial to implement. It’s a real mess Everyone else is being charged $1.80 per trip, and we’re getting hit for $4.50 and getting no fare integration. This is not how a modern city functions, and it cannot go on. I hope that we won’t be waiting as long as October for change – if we are it will definitely be time for two new councillors on the Shore. This is great and long overdue. I don’t understand why you can’t just buy a multi-journey paper ticket based on the zones as well though. I know we want to get people to use AT Hop, but the fare difference would still be enough incentive for most. For visitors however, it would make it much easier if they could purchase a multi-zone paper ticket with the same conditions (5 trips within 4 hours). When changing buses, you would just show your ticket to the driver on the next bus. It works like that pretty much everywhere in Germany and has been for 15-20 years (although the time limit is usually shorter). Also curious what this will do to farebox recovery if 99% of trips get cheaper. Farebox recovery should actually improve due to increased patronage. It will worsen on routes where buses are already full (those routes make more than 100% farebox recovery anyway). Remember that the buses have to run anyway so every additional person you get onboard is helping towards farebox recovery (or at least will do under the new contracts). Overall looks like a huge improvement and will benefit most people greatly both in terms of ease of use and in the pocket. 1) I think there should probably be an overlap zone for Hobsonville with Upper North Shore. 2) They do need to get on with daily fare cap as this is a big incentive overseas to use PT when you know you’re not going to be charged over a certain amount. They can have 3 caps. Cap 1: Up to 3 Zones $12 Cap. Cap 2: Up to 4 zones $15 cap. Cap 3: All Zones $22. 3) Weekly Cap similar to the above… Cap 1: Up to 4 zones $80 cap. Cap 2: All Zones $120 Cap. How that would work is 1) normal zone fares from HOP… then if daily cap reached that is it for the day. Each day the zone or daily cap applies. Then on probably Saturday or Sunday they would reach the weekly cap where they wouldn’t be charged any more so basically get weekends free. For those that don’t use PT much or only travel 1-2 zones a day then normal HOP zone fares would apply which would allow them to take at least 3 Two Zone journeys a day before they would get the 3 Zone daily cap. However if we take bus from Otahuhu town centre and transfer via otahuhu train station yo britomart, it will be 3 zones $4.9. Kelvin, no it will still be a 2 zone fare for the train. The idea of the zone overlap is that you start in the overlap and provided you only go into 1 not both of the zones that overlap you will only be charged 1 zone. So in your case unless you are in the pink Manukau North zone you will only be charged for 1 zone to go to Silvia Park, Onehunga, New Lynn, Mission Bay etc. The new system is being implementd specifically to prevent this situation. It is a two stage fare either way as you are only ever in two zones. Ummm, simpler is better, fair enough. Financially, though I strongly suspect that the net effect will be limited for most commuters, and for me personally it means a substantial increase, ouch. Matt, thank you for laying it out so clearly. Your commute is horrible. If you take a mean of 40 commuting journeys a month (4 weeks x 5 days x 2), then using HOP money you would have paid 396/m, which a first glance looks like a substantial reduction to 196/m with simplified fares, not including any weekend PT journeys. However, in reality you would have purchased a monthly pass, limiting it to 190/m, very slightly less than simplified fares. The HOP money approach will be more flexible, but the pass would usually will save you a little, particularly if you travel in the weekend. So even for what I hope is an unusually long and complex commute, little net effect. For myself, the sector cost is unchanged, so I have already been officially told that I fall into the 99% of people for whom simplified fares represent no cost increase. However, this is false. I need to take about 60 trips, all short, all crossing a zone. previously, the old monthly single zone pass represented a 25% saving. Small but appreciated. Now we have only the one multizone pass, @ 190$, slighly _more_ than using HOP money in most months. It is fair to say that this was a very unwelcome discovery. The old system of passes was not generous. They made little sense for the majority of people, because the threshold was set unreasonably high, to target only very long or frequent PT use. Nevertheless they offered some cap on the cost of travel, and were a good solution for exactly the sort of people for whom simplified fares would be a benefit. I still don’t understand why they have removed the old 140$ monthly pass. The new system looks like a penalty for short haul PT travel. Re: your shorthaul comment. I completely agree. A short haul, say time limited – ie. 10 minute journey – should be capped at less than 1 full zone. It would cover a lot of “quick trip to the shops” and short between-the-zones travel. I asked for the “city-link” fare to be replaced with the citywide short-haul fare ;-( I often catch symonds st bus to britomart, and that’s 1 full zone fare, but the same distance on Queen Street is a third of the price now. Where’s the logic and fairness? The $0.99 child weekend fare seems to me to be an inspired piece of marketing, especially when weekend frequencies are foreshadowed to match the weekday frequencies on most routes under the New Network (the so-called 7/7/7 proposition for the Frequent Service Network, and parity of frequencies throughout the week except at peak hours on many other routes). Not only will this help to put more bums on seats at these off-peak times but it will also make PT affordable for parents with several kids who currently baulk at the cost of an outing by bus when they do a quick calc and figure out what the cost of petrol would be if they drove. And it will likely introduce new adult patrons to the network who may “trial” PT with their kids before deciding to make it a choice when travelling on their own, Well done to AT on this one. The 99¢ fare has another effect—taking the entire family on PT is no longer ruled out due to the high cost. And Sturges Road → Takapuna, wow that’s quite a commute. I work on the North Shore as well, and I thought for a moment about moving somewhere close to the western line as well (with the CRL coming) but decided against it. I really don’t like long commutes. Just curious: how does going via Britomart compare to taking the 224 or similar routes at Kingsland to Fanshawe street? I suspect that is the main thinking behind it. Never tried that, in part because I catch the NEX from Britomart and only transfer at Vic Park if the Taka bus is close. Been times where I see it pulling away just ahead of the NEX and don’t want to wait a full 15 mins. When that happens I just carry on over the harbour and hope for a good connection at Akoranga or walk from there. I’m having a little difficulty trying to work out what my fare would be. If I get on the Western train at Baldwin Ave, get off at Newmarket and get on the Southern train and finally get off at Penrose. Have I travelled one zone? My start and end point are both in the same zone but I need to travel through the City zone to get there. So will it be three zones? Apparently if you don’t tag off when connecting it will be one zone. If you do it will be two. Think it depends on how many zones you tag on or off in, presumably it has to be that way because the system wouldnt know where you were otherwise. So in some cases you are allowed to change trains without tagging off and on again, so it doesn’t count. Unfortunately with buses you allways have to tag on and off every time so changing buses always gets counted. It would never be three, going back into the same zone doesn’t count again (I think!). I don’t understand. Newmarket is one of these grey bubbles, so it wouldn’t count as crossing into the city centre zone? Or does it always count as entering the city zone because that train went via Mount Eden and Grafton? It is in either zone, so Newmarket is in the isthmus zone. So if you go Baldwin Ave (isthmus zone) to Newmarket (isthmus zone) to Penrose (isthmus zone) you stay entirely within the isthmus zone. Pretty sure thats how it works. Yes but how is tagging on/off going to make a difference? It shouldn’t at Newmarket if I’m reading that right, but it would at Britomart because that’s in a different zone. Baldwin Ave to Penrose will be one zone. Generally the rule is that you pay for the total number of different zones you travel through (ie travelling through one zone twice won’t double-count it). But with the trains, because you tag into and out of the rail network at stations rather than tag on and off vehicles (as with buses), it works in your favour and you get to effectively “float over” the city zone rather than go through it, if you don’t tag off (exit the fare gates). AT state “Note: If you are travelling by train between west and south Auckland via the city zone you will not be charged for the city zone if you do not tag on or off in that zone.” (source: the simpler fares page http://www.at.govt.nz/simplerfares). And if you go between west and east lines, I’m sure it’ll be the same because they can’t actually tell if you transferred at Britomart (city zone) or at Newmarket then Westfield/Otahuhu (isthmus zone), so they would have to apply the cheaper fare. Currently I get the bus from Birkenhead to Fanshaw St so this is going to be $1 cheaper for me, currently I pay $4.10, now will pay $3.10 as it’s 2 zones, that’s awesome. This also means I can get a bus from Birkenhead and then change at Britomart for a train to Newmarket and will still be 2 zones, that’s great. I’m a little stuffed, being one station past New Lynn I get an extra zone added on to anything I do. I do think they haven’t quite got the overlaps right, I think the overlap zones should extend to one station either side of the border station, and an equivalent number of bus stops. That way any trip of less that four stations along would always be one zone. yes I honestly don’t understand why they didn’t apply a generic zone overlap. Why pick and choose? It seems to be, although I’m no authority on it, that overlaps with fairly defined interchanges are small because the opportunity for making connections is much more concentrated around the interchange. In areas where that opportunity for connections is more geographically spread out (multiple services arriving and departing over a larger area) the overlaps are bigger to provide ‘opportunity equity’ in the places transfers might begin and end. Sweet – my fare to work just went from $5.90 to $1.80. The bus is looking like a much more attractive option now! $10 a week in economy for my normal professional commute. Or a beer and half, a loaf of artisan bread, a couple of coffees. Genuinely good news. At times I take a few buses for particular food shopping trips on the way home and making them a single voyage could save me $5 in a single trip, and as a quick shopper I will be inside the transfer time limit. Ich liebe Public Transport even more now! How is the tram conversation going? Apart from children and families being the biggest winners in this, I think any cross town Isthmus travellers must be a lot better off. A)the bus you are transferring to is only scheduled every 20 mins but is 11 mins late. B) the bus is scheduled every 30 mins. C) the bus is scheduled less than every 30 mins. E.g. if you connect to western line train on the weekend. Do they give you a bigger window or just consider it a new trip? There is no time window, it works off a digital timestamp. So yes – if the connection/transfer happens at 31 minutes you pay another fare. Sometimes the connector bus can have a very low frequency at 30 minutes or more. a) If a person need to take a walk during transfer, by arrival he may just missed a bus, the next bus could be 30 minutes away. Forcing him to pay two fares. b) The bus that is scheduled in the next 30 minutes to arrives late or cancelled. – The next ride has frequency exceeding 25 minutes. Yeah I think they may have to revisit that 30 minute limit. Should be advertised as 60 (but really 65 or 70 to allow for some of what you describe) … actually I wonder if there will be a difference between advertised (30min) and actual limit anyway?? I agree they should extend the 30 minutes to at least 60. That would allow for a quick stop, say in Sylvia Park to do a quick grocery shop, or bank or whatever and continue on home for example. Or on the bus coming form City to Birkenhead, a 60 minute stop at Highbury for dinner, then continue home… Why not make the system work for its users better? Having a shop/dinner then returning is really like a return trip though in real life and I would think they would want to charge for this if possible. Not ideal of course with any slow connectors. I agree it should maybe be a little longer than the 30 minutes, but I also think this saving should be looked at as a bonus, not a birthright. People get a bus or train into the city now then get a bus up Symonds to Uni. At the moment they pay for that bus. With simplified fares that bus is free. If on the odd occasion timings don’t work out quite right and they have to pay for it, they’ll only pay what they’re paying now anyway. Can’t really complain. In Canberra, the transfer window is 90 minutes. If you’re just going to the nearest town, not even all the way to the city, you can definitely go shopping or food and make a return trip without paying again. Which is why it has been set to 30 minutes. If you’re going somewhere for the sole intention of doing something there then go back home, you absolutely should pay twice. That isn’t a transfer. People who are transferring, people who have no other choice but to get off somewhere to get another bus to where they actually want to go shouldn’t have to pay again. That’s why it’s tricky finding the right length of time to ensure people are using it to transfer and not to run errands for half price. I felt the same about the CityLink. People were complaining when they started charging. If you actually use it as the name suggests – as a ‘Link’ to you next bus – and you use a Hop card then it’s still free anyway. If you’re using it to get a little further up town, then yes, use your legs or pay 50 cents. When the buses still left from outside the Britomart, I actually witnessed people, able-bodied people, wait 6 minutes for a Link then get off at Vulcan Lane. It takes 2 minutes to walk there! Yeah if a connector is only every hour, then this won’t work as intended. Unless they’ve modeled all connections and determined no one ever waits more than a scheduled 30mins between services. Seems unlikely but perhaps it works in practise. Interestingly you can go shopping at Sylvia Park via train and pay one fare journey because there is no physical requirement to tag off the train so, just tag off when you return back to the train after shopping, and then also tag on to your home/next destination; transfer within 30mins done. So, train from Panmure to Britomart would be 2 zones and $3.10 as opposed to existing $4.10 ? Bus from Howick to Panmure, then train to city would be $4.90? This is going to be more expensive for me. The mt eden road 1 stage mark moved from Fairview road to mt eden village. I choose my current rental on Fairview because it was right next to the 1stage mark. I will now have to walk 2 stops along or pay for 2 zones. I dont mind the walk in general but on a rainy day this will be annoying. This is generally looking really good, and will help to simplify PT compared to status quo. The $1 child fare on weekends for HOP is nice, although I note that TransLink in SEQ (Brisbane) is considering allowing children aged 5-14 to travel free on weekends with a go card (https://haveyoursay.translink.com.au/seq-fare-review). So AT’s proposal is not as generous as that found across the ditch. Kids travel free on the Auckland network all the time, just not with the approval of AT and they will pretend they don’t ride free so count them as pax for their propaganda. If they don’t buy a ticket or use a hop they aren’t counted. It’s a shame they are retaining a staged-based system for tagging, with the zonal system for fares only. It defies the concept of a single journey that was supposed to be delivered. Should be one tag on and one tag off per journey IMO. That would be too open to abuse. The tag off, tag on on every bus trip is definitely best practice. That way they also can collect stats of what routes are utilised, where people transfer and actual bus loadings. Very important information for planning PT. What an absurd idea! You seriously want to implement a system where people are allowed to get on and off buses without having to tag on or off or do anything. Just simply waltz on and off legitimately? Wow so my usual commute from pt chev to ellerslie is dropping from $6.20 each way to $1.80. Incredible. As someone said before the isthmus zone people will benefit the most. Actually the people who have like you a fairly decent commute that under the old system was several stages but is now in the same zone are the big winners. So for example someone living in the Botany Downs area and working at the airport should also now be significantly better off in their pocket. Great work by AT, the cheaper fares are an unexpected bonus. I agree they need to make the overlaps a bit more generous and increase the transfer window up to 60 minutes. +1. 45mins should be the min but 60mins preferred. Guess that’s why getting the new network in place asap and delivering more frequent feeder services is so vital if you’re gonna have 30min windows. Even then though it doesn’t help if you quickly want to do a bit of grocery shopping and hop back on the bus/train. Also even with the new network that is still only 7am-7pm so doesn’t help for travelling before or especially for many people after that later in the evening after going out, studying late or working shifts etc when frequencies are lower. Does anyone see the reason why Penrose and Onehunga train stations are outside the overlap zones? what’s the logic. I can’t figure it out. I think Onehunga is in it. Penrose doesn’t need to be as way inside the isthmus zone. Onehunga train station isn’t in the overlap because it makes no difference whether it’s in it or not – you can’t get a train from Onehunga to Mangere Bridge! The zone overlaps are so that whichever direction you go, that is the zone it’s classed as (i.e. Newmarket to Britomart – Newmarket becomes City zone = 1 zone. Newmarket to Onehunga: Newmarket becomes Isthmus zone – 1 zone). If Onehunga train station was in the overlap of Isthmus / Manukau North zone, you’d be travelling through the Isthmus zone as soon as you leave Onehunga anyway. To get into the Manukau North zone you’d have to change at Penrose to a Southern train to Papatoetoe. That could never be classed as 1 zone. ahhh yes I see too now that the station in the map is colour coded orangish. ..in the close up map that is, overall one it clearly shows separate…my bad. The new system costs about 30-40% more if you take a 1 or 2 stage trip that crosses a zone, and travel in the weekend, because of the arbitrary zone + loss of the old monthly passes. The zones are not necessary to the integrated fares and introduce a massive artificial disincentive for short trips. Why are they doing this? There’s no system in place to be able to transfer and pay 1 fare so people who have to use 2-3 buses/trains to get to their destination have to spend a fortune. When you tag on a bus, it’s a surprise when you tag off how much it takes off your card as nobody knows where the stage boundaries are. It also removes anomalies. Bus from Newmarket via Parnell to Britomart or catch a train – 1 stage. Get a bus outside 277 and get off by the university – 2 stages. Not as far as the Britomart, but more expensive. How does that work? The reason for doing it is simple – to simplify it. Tourists, people who don’t speak English, children, anyone should be able to look at the map and say ‘I’m here, I want to go there, that will cost me 2 zones. Boom’. I take the point that it removes some anomalies, but only at the cost of introducing more and rather large anomalies. It is 72% more expensive now to take the train from morningside to mt eden (2 stops and 2 zones) than from new lynn to kingland (5 stops but 1 zone). From what I can tell, the current adult HOP fare from Morningside to Mt Eden is $3.10. Which is exactly what the new fare will be. This is correct. It was always a high cost for such a short hop. Strangely this comforting knowledge is sackcloth and ashes now that it is a fraction of the cost to travel further in the opposite direction. More importantly, for philosophical reasons I try to travel only by PT outside of commuting time as well. The old 140 single zone fare was not generous, not at all, but with some forward planning it capped the total cost of travel and fixed all the anomalies that the new system claims to fix, but doesn’t. Since by definition all the extra use was outside peak hours, I used the service when it is seriously underutilised, helping to supportthe case. 1. double my walking time to take advantage of the fare zone anomaly. AT save nothing by making me do this. I am ummm not a fast walker, more the definition of opposite, but with motivation it might work. 3. bicycle. I stopped bicycling in Auckland after the third time I was run off the road by a bus (twice) or truck. Has it improved? 4. admit to my SO that I was wrong, and just give up. Bicycling is improving over time in Auckland, although admittedly it does depend on the route taken. But a simpler fare system like this that doesn’t discount for very short journeys makes sense as it should motivate many to use a more appropriate travel mode than PT for that distance. E.g. Morningside to Mt Eden station is less than 3km travel, making it less than 10 minutes to ride on your bike. If you previously walked to/from your ultimate origins/destinations to the stations then the overall time saving by bike may be even more. I know some people will pay a bit more than they pay now, but the vast majority will either be cheaper, in some cases a lot cheaper, or the same. It will get more people using hop (because the saving with hop would be over 50% in some cases), it will get more people using ‘technically free’ connector buses instead of filling up the park and rides, and it will get a lot more people using public transport, so overall it’s a good thing. On my last month’s travel, it will be 40% more. Sadness and depression. The consistency is that you can look a the map know it’s gonna cost you this much to go from here to here. whether I take 1 long meandering bus, a bus and a train, 2 buses, whatever, the cost will be the same. I understand where you’re coming from. Your situation is where people will pay 1 zone more. Whichever way it’s done, there will be people who are disadvantaged. For me, concentric zones are the ‘fare’est (sorry) way to go, but Auckland’s shape doesn’t lend itself to concentrics. People are suggesting distance-based fares. They would be incredibly hard to work out for the layman, and a pain in the arse for cash tickets. Getting a bus to Symonds St would then be followed by a ‘and which of the many stops on Symonds St would you like to get off at’ question, instead of just printing a 1 zone ticket. If people get off 1 or 2 stops further on, then they’ve cheated the system. If you live 5km away from where you get on as the crow flies, but you’re on the bus for 10km, would you pay for 5kms, and therefore pay less than some people on the bus for less time, or 10kms? If you pay for 10kms then that would make the train the cheapest option, wouldn’t it, as it’s more direct? The whole point of simplified fares is so that wherever you leave from and wherever you go to, the cost would be the same. Yes, distance based as the crow flies would be the most fair. But would mean ditch cash unless they only buy tickets at a ground based fair machine inputting the exact address. My solution to your issue Alistair is to instead have weekly monthly passes for the amount of zones you usually travel in (instead of the current ‘certain zones’ monthly passes, and instead of the simplified ‘all zones’ pass). If you got a pass for 2 zones for example you pay x amount per month for morningside to kingsland (which would be cheaper than 5 days a week @ $3.10 a trip). On the odd occasion if you went into the city the hop card would charge you the difference between 2 and 3 zones, or charge you a 1 zone trip. The good thing with that would be if you went from Morningside to Henderson you could use the same pass as it’s still 2 zones – doesn’t matter which 2 zones. Say you get drunk in the city and stay over, then go to Sylvia Park then morning after – still 2 zones. Next change in a few years should be upgraded hop to allow purchase of cards via retailers and ticket ATM type machines, Topup like mobile phones perhaps. Ban cash altogether which allows distance based fares as the crow flies. Then we don’t need all this silly overlap zones complication and unfair scenarios. Real distance covered so meandering buses won’t cost more than the NEX or train for example. Could be charged in 20c incremental lots say. Examples and apps make knowing the cost prett accurately and easily. Could perhaps charge slightly more for quality PT like the train as well? Further to this….perhaps would need data points / barriers to bend some theoretical straight lines around when water masses etc are in the way. The overlap zone between central and West seems small, so would disadvantage a few people just crossing over. e.g. from Green bay to say Blockhouse Bay Road or Avondale which is 2 zones. Maybe this overlap zone should include Avondale and the surrounding area. Compare that to Pt Chev to St Heliers – 1 zone, or Avondale to Sylvia Park – 1 zone. In the main though, this is a huge improvement and makes using public transport much more competitive cost-wise compared to driving. Wow – just realised from anywhere in the isthmus to the airport via train (Papatoetoe) and the 380 bus will only cost $3.10. From Britomart it’s a 3-zone trip, no? So $4.90 Hop. Still beats the Sky Bus fare. In addition AT are investigating the upgrade of the 380 to a frequent route to match the trains every 10mins. I use this combo from the CBD all the time and sometimes the same and normally not much longer end-to-end trip length to/from airport. $3-10 – $4.90 is great value for an airport service. . I hope this will happen. It’s nuts that it wasn’t upgraded as part of the new southern network. Also if it is to be a true Airport transit option the Onehunga end has to be have a simplified, express route rather than stopping at just about every bus stop on the way. And yes, I was very disappointed to see the AT journey planner only showing Skybus as an option. WTF?!! No wonder there are only a few people using the 380 route. It would help if the bus driver on the service would be a lot more courteous than the one I got on Sunday night who was rude to several passengers between the Airport and Papatoetoe station. I think I alone was the only one who had used the service before so others didn’t know the route. The bus driver didn’t take this “ignorance” very well. It would be no shock if none of the other passengers used this option again. This doesn’t work for everyone as I travel from Hibiscus Coast to Smales Farm and have always had a Zone B Monthly pass which cost $140, AT Transport have got rid of this and we now have to pay $200 a month for the same trip off $4.90 for 3 zones which works out to around $196 a month!!!! Wonder how many people will now go back to using their cars? ouch; we now really need a 2 zone pass to deal with the new anomalies. Correct – 3 zones from Britomart; but only 2 zones from everywhere in the isthmus zone. A pretty good deal if you live in Newmarket, New Lynn, St Heliers etc. Even better from Howick – only $1.80. I’m feeling left out. All these people excited about the savings, and my 2.2km / 5 min by car journey from Ponsonby to Westmere has increased from $3 to $3.10. It seems crazy that people can travel from St Heliers to New Lynn and Pt Chev to Ellerslie for $1.80, and anywhere in Isthmus Zone to Airport for the same cost as Ponsonby to Westmere, but I guess if it gets more people out of their cars, it will make the 10 minute bike ride more pleasant.